In creating Cost Plus Payment Claims, the Material Costs from Suppliers and Subcontractors are printed on separate tables by default. However, you can have it printed in one table by modifying your template settings. 1. To do that, click the Template Settings button on your Cost Plus Payment Claim Form then select Template 1. The default template is Template 2. 2. After selecting a new template, you will see the message below. Clicking OK will load your new template and refresh your current work. Hence, it is important that you decide which template to use before making your claims. 3. The page will refresh automatically and your selected template will be applied. You can click on the Template Settings button again to verify this. This is the default template for Cost Plus Payment Claims. 1. Your Material Costs from Suppliers are displayed under Item 2: Material Cost table. 2. 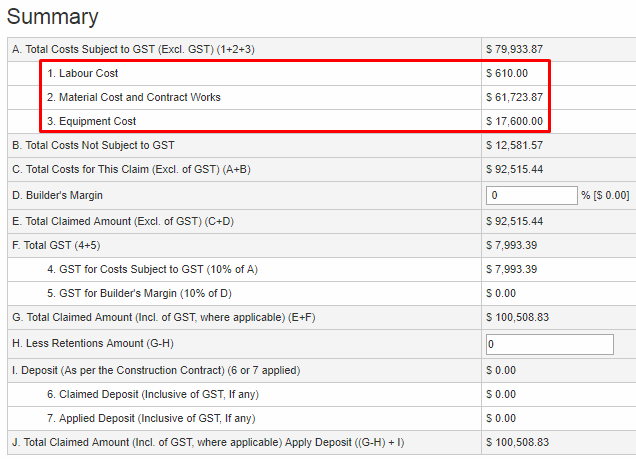 Your Material Costs from Contractors are displayed under Item 3: Contract Works table. 3. You can modify the columns present in each table by ticking/unticking the column names on the Column Settings. 4. On your Summary table, there are 4 rows under row A. These rows represent the 4 tables that contain your costs that are subject to GST. 5. Same templates are used on the Cost Plus Payment Claim Form and on your generated Cost Plus Payment Claim document after submission. 1. In this template, your Material Costs from both your Suppliers and Contractors are displayed under Item 2: Material Cost and Contract Works table. 2. You can modify the columns present on the table by ticking/unticking the column names on the Column Settings. 3. On your Summary table, there are 3 rows under row A. 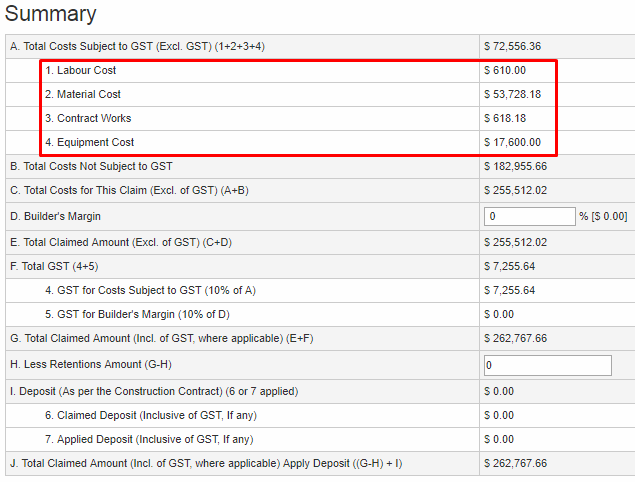 These rows represent the 3 tables that contain your costs that are subject to GST. 4. Same templates are used on the Cost Plus Payment Claim Form and on your generated Cost Plus Payment Claim document after submission.